Mammography is a diagnostic test used to screen for breast cancer. It is very important in the early detection of breast cancer because it can find tumors and irregularities in the breast tissue while they are still too small to be felt by you or your doctor. 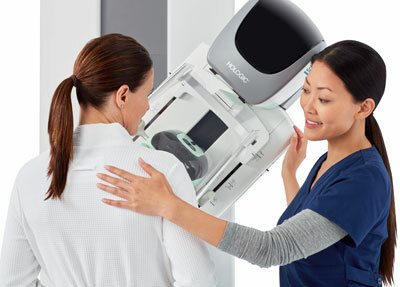 Mammography is a low-dose x-ray that takes an image of the inside of your breast. The exam usually takes about 20 minutes. Tumors detected by a mammogram may be benign or cancerous. Further tests and removal of the tumor may be necessary before a definite diagnosis can be made. Be sure to schedule your mammogram at least seven days after your last period started and two weeks before your next period is expected. This is a time when breasts will be least tender. The test is not painful, but some women experience minor discomfort. On the day of your mammogram, do not use deodorant, perfume, or powder. The American College of Obstetricians and Gynecologists breast cancer screening guidelines recommend mammography screening be offered annually to women beginning at age 40. For more information on breast issues, visit The American College of Obstetricians and Gynecologists website.